Love animals? Enjoy gardening? Glade Run Adventures is recruiting new volunteers for our therapeutic equine, animal, and horticulture program! 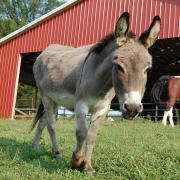 Help out in the gardens and greenhouse, or help feed and turn in/out the horses and other animals. Flexible opportunity that is perfect for individuals, families, or groups! No skill required - we will train! Age 8 with a parent/guardian, age 12-18 for junior volunteers. Adults of all ages.